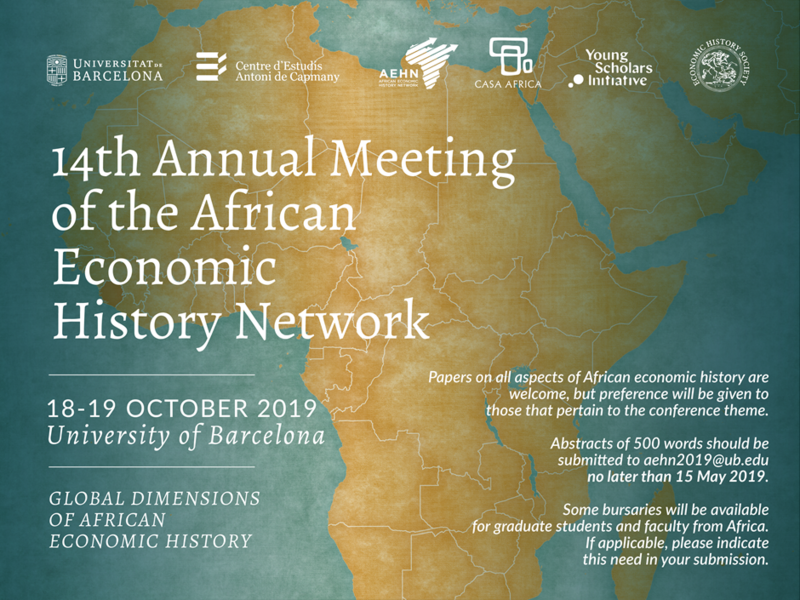 14th Annual Meeting of the African Economic History Network, 18-19 October 2019 at University of Barcelona, Spain. The AEHN Meeting is an annual gathering devoted to the discussion of work in progress in the economic history of (mostly Sub-Saharan) Africa. Gareth Austin organized it at the London School of Economics (LSE) in 2005-10, and at the Graduate Institute in Geneva in 2011 and 2012. Since then it has moved each year, as shown in the figure below. 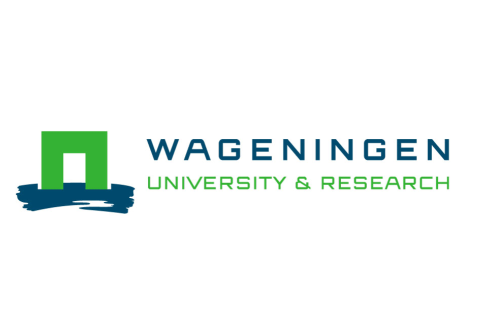 Erik Green brought the 2013 workshop to Lund University, Leigh Gardner brought it back to the LSE for 2014, and the 2015 Meeting was hosted at Wageningen University by Ewout Frankema. The 2016 meeting was organised by Alexander Moradi, Felix Meier zu Selhausen and Gerardo Serra at the University of Sussex. Johan Fourie and LEAP brought the Meeting to Stellenbosch University in South Africa – taking place for the first time on the African continent. In 2018, the Meeting was then hosted by Karin Pallaver at Bologna University. The format in the first six years was 7-11 short papers, which everyone read in advance, discussed in half a day followed by dinner. Most participants were PhD students and postdocs. Prior reading and short presentations remain the ideal, though some compromises have been necessitated by the growth in the number of papers presented. Some of the original junior participants now have their own research students, and the recent meetings have been notable for the participation of more senior as well as (in absolute terms) more junior scholars, while the much larger overall number of papers now means that the workshop needs at least a day and a half. The 2012 meeting enjoyed supplementary funding from the Swiss National Science Foundation, enabling the participation of more scholars from Africa and North America, and leading to the production of a special issue of the Economic History Review on ‘The Renaissance of African Economic History’ (November 2014), the first special issue to be published by a ‘mainstream’ economic history journal. However, the spirit of the gathering remained and continues to be informal, an opportunity to present first drafts as well as revised versions. 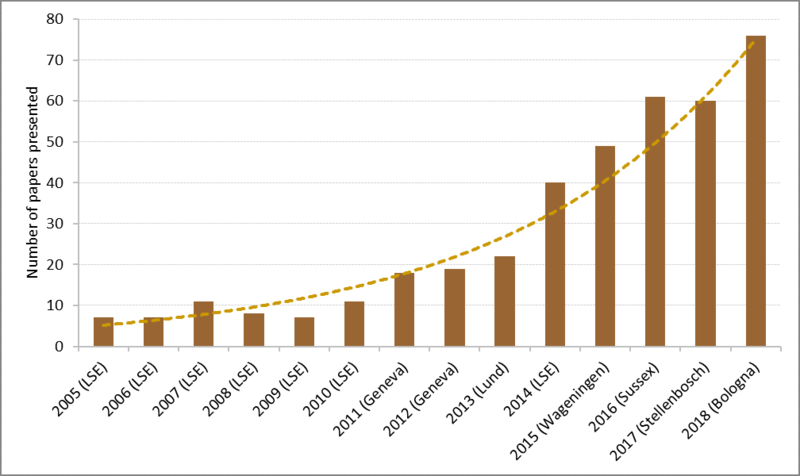 The number of participants and presentations have been growing steadily every year, as shown in the figure below.